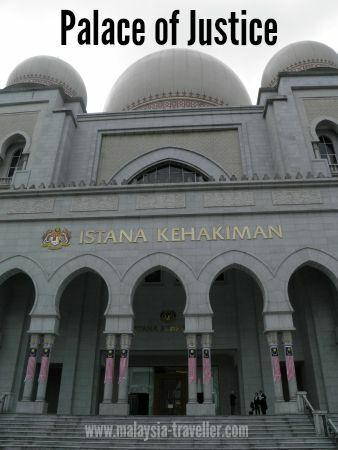 Few people are aware about the Justice Museum Putrajaya, a courts museum located inside the grandiose Palace of Justice building (Istana Kehakiman) in Putrajaya. Unless we are in the legal profession we try to avoid courts and seldom get the chance to find out what goes on in the legal world. 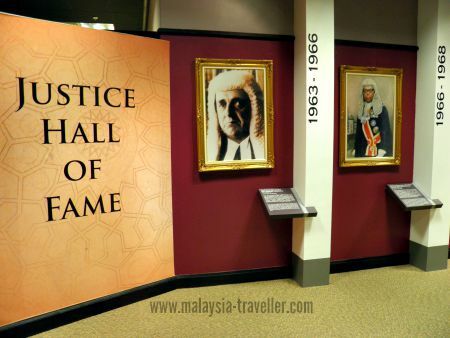 At this museum you can learn how Malaysia’s legal system developed, view a mock-up High Court trial, see wigs, costumes and other lawyerly paraphernalia. 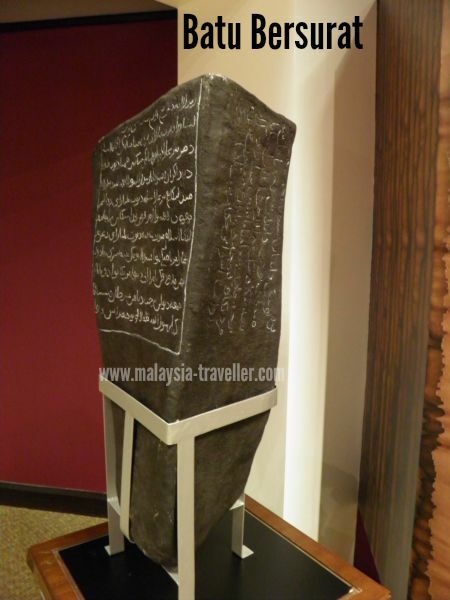 This stone monument dating back to 1303AD, called the Batu Bersurat, was discovered near Padang Tara in Terengganu in 1887. Its inscriptions in Jawi contain Islamic Commandments, for example in the case of a married woman committing adultery, she is to be ‘buried to the waist and stoned to death’. It also reveals that Terengganu was the first place in the region to convert to Islam, 702 years ‘after the demise of the Holy Prophet’. Panels explain the history of how the legal system developed during the Portuguese and Dutch colonial periods and how it was changed during the Japanese occupation. 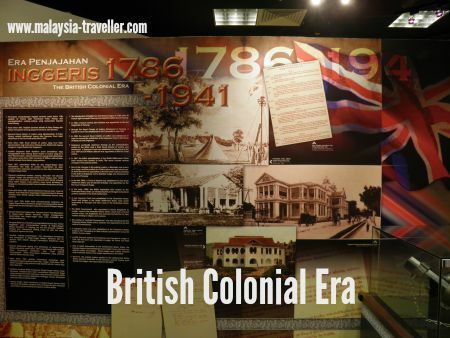 The British Colonial Era, beginning in 1786, saw Sir Francis Light introducing English laws into Penang which still today form an important foundation to Malaysia’s legal system. There is a mock-up of a trial in the High Court, complete with the judge’s bench, the accused, witness, barrister and a jury. 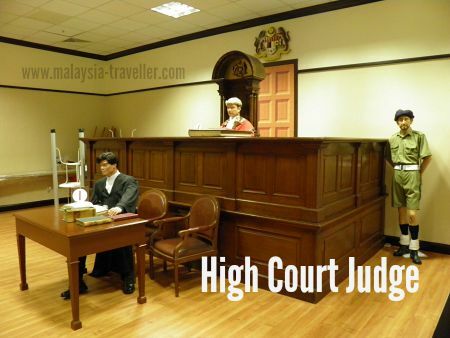 The judge sits on a high backed teak wood chair topped with a wooden canopy bearing the coat of arms of Malaysia. Persons entering or leaving the courtroom should bow as a mark of respect for the authority represented by the coat of arms. The exhibit explains that trials by jury were discontinued in Malaysia in 1995 (is that a good thing)? 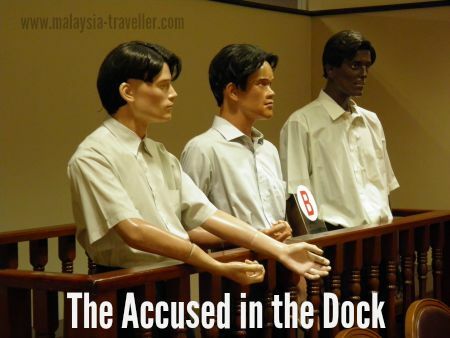 The accused in the dock are obviously guilty - of wearing ill-fitting wigs! 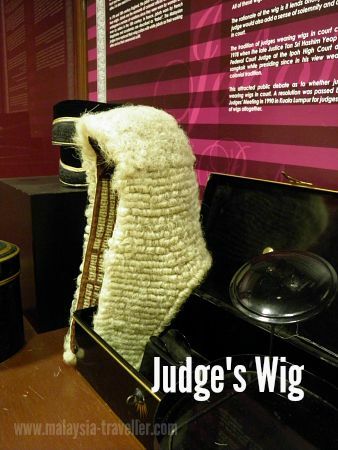 Talking of wigs, there is a display providing background to the wearing of wigs in court by barristers and judges. In 1990 judges decided to discard the wearing of wigs altogether. Not surprising - they are made of horse hair and must be very hot in the Malaysian climate. There are examples of judges’ robes too including red colour robes which were worn during criminal trials. We are told that the sight of scarlet robes was enough to put fear into the hearts of the most hardened of villains. Scarlet robes are no longer worn in Malaysia, only black ones. There are biographies of all Chief Justices of Malaysia since Independence. The gentleman on the left here with the strict demeanour was Tun Sir James Beverage Thomson who was the first Chief Justice of the Independent Federation of Malaya. 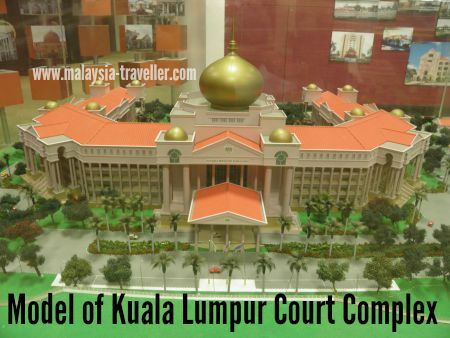 There is a display of pictures and models of court buildings around the country. 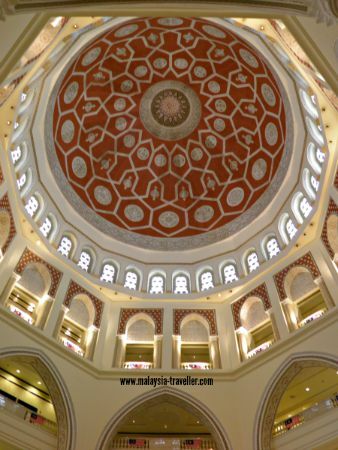 A trip to the Justice Museum Putrajaya enables visitors to see inside the magnificent Palace of Justice building and admire the ornate decoration of the dome. The Palace of Justice houses judicial departments as well as the Court of Appeal and Federal Courts and judges’ chambers. Some cynics will joke that the only place to find justice in Malaysia these days is in a museum! That would be unfair. Judging by the smartly dressed and proficient barristers and lawyers wandering the corridors of the Palace of Justice we can be confident that they continue to practice their noble profession in the best interests of their clients and the nation as a whole. This museum is well worth visiting. The museum is open during government office hours, i.e . 9am to 5pm on weekdays only. Smart attire is required (long trousers, shirt and proper shoes for men) no T shirts or flip flops. You can take photos in the museum but not in the courtrooms. Your bags will be x-rayed. The museum is located in The Palace of Justice in Precinct 3, Putrajaya. I have marked the location on the map on my Top Putrajaya Attractions page.